We wrote about another rising blockchain platform recently, and we just can’t leave EOS out this time around. The blockchain devised by Block.one raised over 7.12M ETH in its ICO last year (around $4B, no biggie) and became one of the most anticipated launches of 2018. What did EOS achieve in 2018? How’s it looking for 2019? What games are already on EOS? You’ll find the answer to these and other questions nobody asked us, below. EOS is a smart-contract-enabled blockchain protocol. Its proprietary cryptocurrency is the eponymous EOS. The chain was created by private software company Block.one with the intent of eliminating transaction fees and raising the bar for Ethereum’s tps rate. By using the DPoS model—Delegated Proof of Stake, token holders take random turns building blocks; but not every node participates. Major Block Producers are voted by token holders, a.k.a. the general public. Since these BPs are not miners competing to build blocks, the DPoS system offers higher speed and scalability than most of its competitors. Its asynchronous Byzantine Fault Tolerance ensures greater security considering that you need 15 out of the 21 BPs to significantly compromise the network. EOS website refers to it as the most powerful infrastructure out there for dapp development and hosting and maybe they’re not so wrong. EOS peaked in April 2018, when it was traded for $21,46. Soon after the mainnet launched on June 9th of last year, EOS’s price was around $10, but then continue falling and never went back anywhere close its past values. This rapid decline happened across the entire crypto market, with almost every other cryptocurrency experiencing similar changes and due to this the current price still allows EOS to be placed #5 on CoinMarketCap. Where did EOS come from? The mastermind behind EOS is Block.one, as we mentioned above. EOS was born as part of Block.one’s main mission: turning mass adoption in blockchain technology into an actual reality. Block.one’s ICO for EOS managed to raise the equivalent of 4 billion dollars (at that time anyway) in ether. As many before and many after it I assure you, EOS was set to be the company that would change everything as we knew it, and as John Oliver said it, it certainly didn’t change the world. There are just some things that cannot be solved with the use of technology. Regardless of skepticisms, EOS has attributes that makes it stand out from the rest, close enough to be on the Prom Queen’s ballot at least. 10 years after the birth of the first cryptocurrency, millions of people have welcomed blockchain technology into their lives, raising the need for platforms that could satisfy the ever-growing demand. One of the issues that came with the territory is how much time transactions take to be processed—not to mention the high fees for these transactions to take place. EOS came and tried to solve Bitcoin’s and Ethereum’s scalability issues, being an upgrade to these alternatives by working much faster than the aforementioned blockchains, like, it’s not even fair play; it’s like comparing a toy truck to a Lambo. EOS all-time high is 6,234 T P S while Ethereum’s max. is 15 tps and the blockchain itself has said before that scalability improvements for the chain would take years to be executed. EOS cryptocurrency is currently the fifth largest currency in the cryptoworld. Making transactions for free and not having to wait forever for them to be processed are definitely important factors that contributed to this milestone. EOS VC fund focuses specifically on financing projects that help the EOS ecosystem to grow. The funds—over $1B, are assigned to support different partnerships with blockchain-focused companies building on the EOSIO software. By providing this type of support, game-changing blockchain-based products and entrepreneurs can get advice and directions to continue developing on the system. The main goal is to create quality products that help lead blockchain into mass adoption. You can apply for this funds by submitting your project, whether it’s at early stages or under the tutelage of established companies. How can I play games on EOS? The first step to start playing is to forget everything you’ve learned on Ethereum. Gas fees? No. Long transaction time? No. Staking? Yes! Voting? Yes! WTF is this?! YES. Instead of Metamask you’ll need a wallet like Scatter (sounds like no difference at all, but wait, it’s coming). It’s neet an EOS account as well, and then connect it to your wallet (and here’s where you can f*ck things up easily, just by not saving you private key). There are 3 different resources on EOS: CPU, Network and RAM. To use the chain (and to play games of course) you’ll need to stake your tokens on CPU and Network, and buy some RAM. You’ll get your staked tokens back in 72 hours’ time (and lose control over your portions of CPU and Network), but during that period you can use the chain, execute transactions, etc. Yawn, we got bored just by explaining this small piece of info. The main problem here is that the more people use the chain, the more EOS you need to stake to perform action. For example, EOS Knights in-game activities—rebirth, trading and crafting consume loads of CPU, and their FAQ reads: “3 EOS is sufficient when the chain is free...but staking at least 15 EOS is advised”. That’s how many EOS you need to play. Don’t forget that you can’t simply buy EOS with your credit card; go explore the fantastic new world of crypto exchanges. 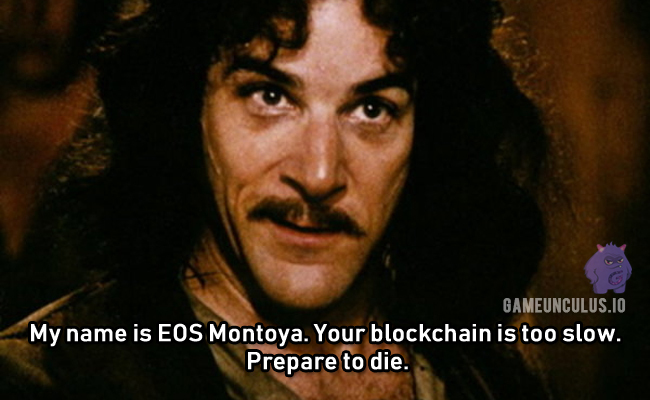 Argh, this EOS will make you an expert even if you just want to play a game! Monster EOS was the first ever EOS game, and we should show some respect. While others were sitting out the fight, Monster EOS was busy making history. The game launched on June 18th, 2018—a few days after the EOS mainnet went live, and positioned itself as a Tamagotchi styled CryptoKitties. Surprisingly 15-25 fanatic gamers keep playing it every day, which makes this EOS OG game more popular than most games out there. This has been a real winner for EOS. At the time of its launch in August, the game was able to recruit more than 1,000 players in three days, and three months later they had reached 10,000 players. It has managed to stay at the top of the charts since its release, and it ranks as the #1 game dApp. They certainly are planning to stay and we actually kind of wanna know what’ll happen next. It was the first to run on both ETH and EOS and when TRON joined the action it became the first game available on all three. The Cuties integration with EOS launched on October 30th of last year. Maybe it wasn’t such a smart move for the Cuties since the latest statistics show that no one plays the game on EOS, but we still have to acknowledge this milestone, after all it was the first one to run on ETH and EOS. The new game by 0xGames studio which has successfully finished its pre-sale, is a multi-blockchain game, but was first launched on EOS. Sergey Kopov, the studio’s founder, said, “Our team believes the technology has great advantages and is very flexible. EOS has an active community behind it with not as many games, we decided to merge the two ecosystems and by the looks of the response we received we are working in the right direction”. Controversy is something no one can escape, and that goes for blockchain-producing companies too. EOS has found itself under the spotlight a couple of times—though sometimes undeservedly so. Probably one of the biggest controversies EOS’s been through is the breaking point they had with co-founder and former Block.one CSO, Brock Pierce. Let’s go back to March to when a certain talk show host dedicated an entire episode to cryptocurrencies. This was months before EOS release and at the time Brock Pierce was at the head of Block.one. He had been involved in a couple of sexual harassment lawsuits—aside from his past as a child actor and Disney star, that were brought up during the show, to try and convince people that EOS probable wasn’t going to be the next big thing. Basically, the host was startled that EOS ICO had managed to raise over $1,5M in 9 months, while bigger companies like Facebook and Google took years to raise the same amount. After this controversial episode Block.one stated that they were no longer working with Pierce and they referred to the split as a “mutual” decision. They even published a letter on their Medium addressed to the host stating that the agreement between them and Pierce had been the idea since the beginning, with him transitioning to independent community building and investment activities after completing his work with the company. A smart move to keep the investments coming. It should come as no surprise that EOS has been referred to as a scam more than once in the past, like most cryptoprojects before they take off. Some are just reddit threads but other times more drastic accusations are made. On the 1st of October, Block.one’s CEO Brendan Blumer, shared a statement in which the company owned up to knowing important info regarding allegations that collusion was taking place in the company. Here, Blumer addressed some unverified claims that there were irregularities with the Block Producers voting, as well as the subsequent denial of those claims. The platform’s most considerable BPs—which apparently are the equivalent of Bitcoin’s entire block-production team, were accused of colluding to perform mutual voting accompanied by pay-offs. Huobi, a Chinese exchange and the fourth biggest BP on EOS was one of the parties involved, compromising EOS its own reputation. Whether 2018 was the year to get acquainted with blockchain tech or not, 2019 must have some tricks up its sleeves—if years wore clothes that is. EOS is hosting a Blockchain Hackathon with a prize pool of $1,500,000 to be distributed in 5 separate events where you get in teams of 5 people max. and try to create the best project by using the EOSIO platform. Everyone over 18 is welcomed to participate and guess what? There’s a thing called Hack.Pitch.Launch—a new initiative that helps team projects that have been developed at EOS Global Hackathons to thrive and conquer their goals! This will definitely keep us on our toes, but until there are actual results go to Gameunculus’s Telegram and follow him on Twitter to share your thoughts on EOS!